The diagram below shows a typical results page from a Google search. 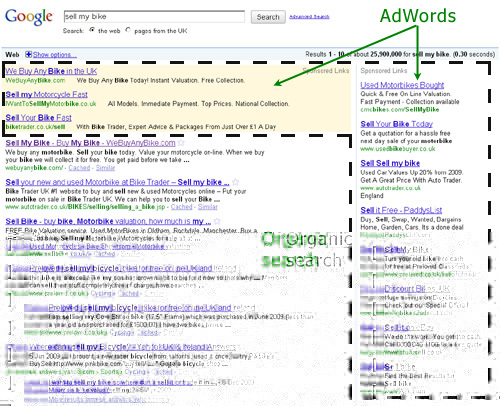 The area contained by dashed lines is where the "Sponsored Links" or the "AdWords" are shown. The rest of the page is taken up by the "organic" search results. So what's the difference? The "organic" search results are links to the websites that Google consider the most relevent to the words searched for, the AdWord results are the adverts of companies who have paid to be displayed when those words are searched for. By having a search engine optimised site that is associated with the searched for keywords and considered by the search engine to be very relevant. Paying to appear when those keywords are typed into a search engine. You can read more about search engine optimisation in this article: "What is Search Engine Optimisation?" Onsitenow can guide you through setting up an adwords account and training you to use the system, it's very straight forward and takes just a couple of hours.